Have a small business or group? Come celebrate with us as we have created a “BIG PARTY” ambiance for small business and groups! Cocktail hors d’oeuvres, Festive Meal, Sweets Table and Music Provided by our in-house DJ. Bring your group out for a festive meal then dance the night away with other small business or groups! 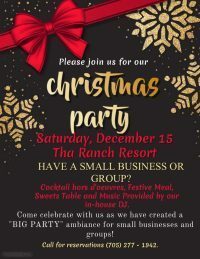 This is a great opportunity to network with other small businesses while still enjoying a Christmas Party! For more information and updates check out our Facebook Page!